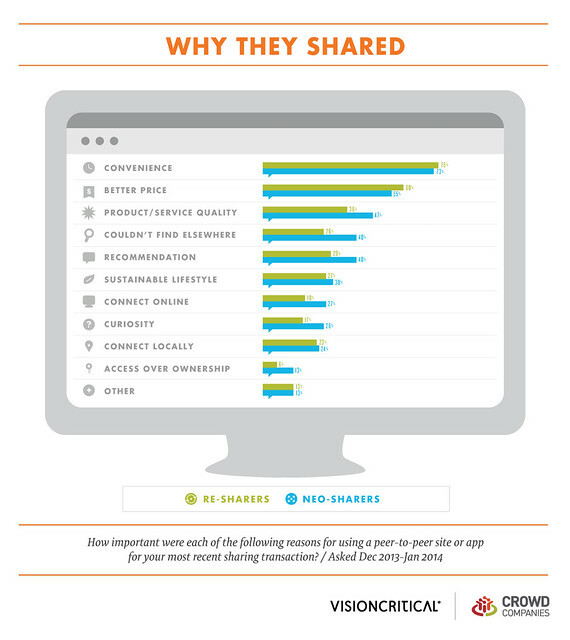 Below Graphic: Partnered with Vision Critical, Crowd Companies (the association I started for big brands in the collaborative economy) surveyed over 90,000 people to find out why they share goods, services, space, transportation, and money. Over the coming months, we’ll be dissecting some of the key findings from the largest study ever done on the Collaborative Economy, sharing both factual data and insights beyond market observations. When people first think of the sharing economy, a subset of the greater Collaborative Economy, they think of technology-laden hipsters in communes. What we found was quite the opposite – that this sharing behavior is common place behavior across many scenarios. We discovered that people often share for reasons that made pragmatic sense for themselves – not community altruism. If you want to view the entire report (over 28k already have), you may download it by clicking here. People participated in sharing because . . . It is more convenient: It’s easier to get things from local markets, or efficient websites. For example, ride sharing with Uber and Lyft in San Francisco takes just a few quick clicks on a mobile app, with no credit cards or cash to fuss with, or cranky cabbies to hail. People who use eBay or online markets can quickly acquire or sell things via an online experience rather than fussing with a consignment store downtown. Commissioning a professional on oDesk or eLance is easier than managing a full time employee or dealing with taxes. It is a better value: Getting used goods at a local level can often be less expensive than buying new. Poshmark, Threadflip, Rent the Runway, Bag Borrow and Steal all offer women’s fashion at a fraction of the retail price, yet providing the opportunity for women to look amazing in top stylish brands. Why own a town car when you can summon one on demand with Uber? Why deal with aircraft or boat maintenance when you can borrow a boat or a plane from a peer? In fact, in the Collaborative Economy, you can live like royalty across many verticals –without owning a throne. It is a unique experience: Here’s where things get interesting. The consistency of cookie-cutter hotel rooms and common taxi rides are giving way to the unique experiences provided by Airbnb tree houses, lofts and homes, and Lyft rides where drivers fist-bump you in a themed, friendly ride. We found a group of people in the Collaborative Economy called Neo-Sharers who partake in sharing experiences (services, space, transportation) seeking unique, local, one-of-a-kind experiences – the opposite of the standardized products created by the concept of mass production. While a lower priority, sustainability and altruism win too. While lower on the list, this list is a still a great place to be. People are participating in efforts that reduce consumption and waste, by sharing existing resources like cars, homes, products, and goods, rather than buying new. As a result, people are getting what they want (convenience at a better price) while conserving resources around them. This is a great example of the healthy-eating sector mantra that “healthy food that tastes good too.” For the sustainability minded, sharing is an opportunity to leverage. The bottom line: There you have it. People tend to participate in the Collaborative Economy because it is practical and beneficial for themselves, while, at the same time, gaining a more sustainable lifestyle.